Zirconium (chemical symbol Zr, atomic number 40) is a strong, lustrous, gray-white metal that resembles titanium. It is obtained chiefly from the silicate mineral zircon and is highly resistant to corrosion. The purified metal is primarily used by the nuclear industry to form the outer layer of fuel rods in nuclear reactors. Zirconium is also used in corrosion-resistant piping, heat exchangers, and lamp filaments. Impure zirconia (zirconium oxide) is used for heat-resistant materials, such as for furnaces and laboratory crucibles, and purified cubic zirconia is used as a low-cost substitute for diamonds. Alloys of zirconium are used for medical implants and prosthetic devices. Its alloy with niobium is superconductive at low temperatures. Also, zirconium-aluminum alloys are used to make high-strength bicycle frames and lacrosse sticks. In nature, zirconium is found combined with other elements but has never been found as a free metal. The principal economic source of zirconium is the mineral zircon (zirconium silicate, ZrSiO4), deposits of which are located in Australia, Brazil, India, Russia, and the United States. Upon extraction, it appears as a dark, sooty powder, or a gray, metallic, crystalline substance. Zirconium and hafnium are contained in zircon at a ratio of about 50 to 1 and are difficult to separate. This element is also abundant in S-type stars and has been detected in the Sun and meteorites. Lunar rock samples brought back from several Apollo program missions to the Moon have a high content of zirconium oxide relative to that in terrestrial rocks. Zircon is a co-product or byproduct of the mining and processing of heavy mineral sands for certain minerals of titanium (ilmenite and rutile) and tin. Zirconium is also in 30 other recognized mineral species including baddeleyite. This metal is commercially produced by reducing zirconium(IV) chloride with magnesium in the Kroll process, and by other methods. Commercial-quality zirconium retains a content of 1–3 percent hafnium. Commercial zirconium naturally contains 1-5 percent of hafnium, and it is extremely difficult to separate these two elements from each other. Nonetheless, for applications in nuclear reactors (see below), zirconium needs to be prepared free of hafnium contamination. Two main processes are used for this purpose: liquid-liquid extraction, used mainly in United States, and extractive distillation, used primarily in Europe. The resulting reactor-grade zirconium is about ten times as expensive as the hafnium-contaminated commercial grade. The separated hafnium is used for control rods. The zirconium is used mostly almost pure, in the form of low alloys, most often from the zircaloy group. Zirconium (Arabic zarkûn, from Persian zargûn زرگون, meaning "gold like") was discovered in 1789 by Martin Heinrich Klaproth and isolated in 1824 by Jöns Jakob Berzelius. The mineral zircon, or its variations (jargon, hyacinth, jacinth, or ligure), can be found in biblical writings. The mineral was not known to contain a new element until Klaproth analyzed a jargon from Sri Lanka in the Indian Ocean. He named the new element Zirkonertz (zirconia). The metal was isolated in an impure form by Berzelius, who heated a mixture of potassium and potassium zirconium fluoride in a small decomposition process conducted in an iron tube. Pure zirconium was first prepared in 1914. The crystal bar process (or Iodide process), developed by Anton Eduard van Arkel and Jan Hendrik de Boer in 1925, was the first industrial process for the commercial production of pure, ductile, metallic zirconium. It was superseded by the Kroll process. Zirconium is a transition metal that is located in period 5 of the periodic table, between yttrium and niobium. In addition, it lies in group 4 (former group 4B), between titanium and hafnium, and is closely associated with these two elements. This metal is grayish-white, lustrous, strong, and exceptionally resistant to corrosion. It is lighter than steel, and its hardness is similar to that of copper. When finely divided, the metal can spontaneously ignite in air, especially at high temperatures. (It is much more difficult to ignite the solid metal.) An alloy of zirconium and zinc becomes magnetic at temperatures below 35 K. The oxidation state of zirconium is usually +4, although it may also occur in oxidation states of +3 and +2. Naturally occurring zirconium is composed of four stable isotopes: 90Zr, 91Zr, 92Zr, and 94Zr. In addition, it has one extremely long-lived radioisotope, 96Zr, with an estimated half-life of more than 3.9x1020. The second most stable radioisotope is 93Zr, which has a half-life of 1.53 million years. Many other radioisotopes have been characterized. Most of them have half-lives that are less than a day, except 95Zr (64.02 days), 88Zr (63.4 days), and 89Zr (78.41 hours). Zirconium(IV) chloride or zirconium tetrachloride (ZrCl4): It is a white, high-melting solid that hydrolyzes rapidly in humid air. It is a key intermediate in the conversion of zirconium oxide to metallic zirconium by the Kroll process. It is the principal starting compound for the synthesis of many organometallic complexes of zirconium. Zirconium dioxide or zirconia (ZrO2): This white oxide of zirconium can take several crystalline structures. The monoclinic structure, found in the rare mineral baddeleyite, can be converted by heating to tetragonal and cubic crystalline structures. The latter two structures need to be stabilized by the addition of different oxides (such as magnesium oxide, calcium oxide, or yttrium oxide). The cubic crystalline form, called "cubic zirconia," is synthesized in various colors for use as a gemstone and is the best known diamond simulant. The cubic phase of zirconia also has a very low thermal conductivity, which has led to its use as a thermal barrier coating in jet turbines and diesel engines to allow operation at higher temperatures. In addition, it is used as a refractory material, in insulation, abrasives, enamels, and ceramic glazes. Stabilized zirconia is used in oxygen sensors and fuel cell membranes because it has a unique ability to allow oxygen ions to move freely through the crystal structure at high temperatures. This high ionic conductivity (and a low electronic conductivity) makes it one of the most useful electroceramics. Zirconium has a low absorption cross-section for thermal neutrons, making it ideal for nuclear energy applications, such as for the cladding (outer layer) of fuel rods. More than 90 percent of zirconium metal production is consumed by commercial nuclear power generation. Modern commercial-scale reactors can use as much as a 150,000 meters of zirconium alloy (Zircaloy) tubing. Reactor-grade zirconium has to be freed of hafnium (which has six hundred times higher neutron cross-section). Hafnium-free zirconium can be ten times more expensive than zirconium with a natural content of hafnium (at 1-5 percent). The separated hafnium is used for control rods. The zirconium is used mostly almost pure, in the form of alloys, mostly from the zircaloy group. Zirconium is also extensively used by the chemical industry for piping in corrosive environments. Zirconium (when finely divided) is flammable and has been used in military incendiaries (such as Dragon's Breath). Human tissues can easily tolerate this metal, which makes it suitable for biocompatible implants. In one such application, zirconium metal (alloyed with niobium) is intentionally oxidized to produce an abrasion-resistant, high-integrity zirconium oxide ceramic surface on total hip or total knee replacement devices. The major end uses of zircon (ZrSiO4) are refractories, foundry sands (including investment casting), and ceramic opacification. Zircon is also marketed as a natural gemstone used in jewelry. 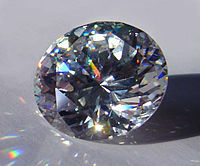 Cubic zirconia (ZrO2) is processed to form a brilliant, clear crystal that is used as a low-cost substitute for diamond. Impure zirconium oxide (zirconia) is used to make laboratory crucibles that can withstand heat shock, for linings of metallurgical furnaces, and by the ceramic and glass industries as a refractory material. The carbonate was used in poison-ivy lotions until it was noticed that many people are allergic to it. Zirconium is also used in heat exchangers, as a "getter" in vacuum tubes, in lamp filaments, and various specialty alloys. When alloyed with niobium, zirconium becomes superconductive at low temperatures and is used to make superconductive magnets with possible large-scale electrical power uses. Zirconium diamide-diamine complexes can be used to catalyze the polymerization of alkenes, especially ethene (when activated with a material called trityl-BArF). Zirconium nitride has been used recently as an alternative to titanium nitride for coating drill bits. Both coatings appear to keep the bit sharper and cooler during cutting. Bicycle manufacturers incorporate zirconium-aluminum alloys in their high-end bicycle frames. With this combination, the frame becomes much stronger and lighter. Zirconium is also used in the manufacture of high-strength lacrosse sticks. Compounds containing zirconium are not noted for toxicity. The metal dust can ignite in air and should be regarded as a major fire and explosion hazard. Zirconium has no biological role. Chang, Raymond. 2006. Chemistry. 9th ed. New York: McGraw-Hill Science/Engineering/Math. ISBN 0073221031. Cotton, F. Albert, and Geoffrey Wilkinson. 1980. Advanced Inorganic Chemistry. 4th ed. New York: Wiley. ISBN 0471027758. Greenwood, N. N., and A. Earnshaw. 1998. Chemistry of the Elements. 2nd ed. Oxford, U.K. and Burlington, MA: Butterworth-Heinemann, Elsevier Science. ISBN 0750633654. Online version. Marek, Ilan, ed. 2005. New Aspects of Zirconium Containing Organic Compounds. Topics in Organometallic Chemistry - 10. Berlin, Heidelberg, New York: Springer. ISBN 3540222219. Zirconium. Los Alamos National Laboratory. Retrieved December 16, 2006. All links retrieved July 2, 2013. This page was last modified on 2 July 2013, at 16:09.